We are so excited to welcome Maddie! Madalyn Elise was born via C-section almost 2 weeks ago weighing in at 8 lbs and 3 oz and 20.5 inches long. 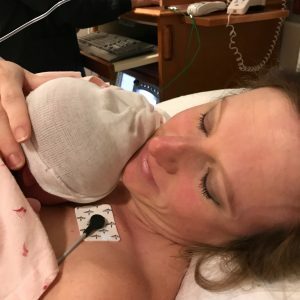 I had hopes of a VBAC but those hopes were dashed a couple weeks prior when I found out that my body just wasn’t responding like we had hoped. 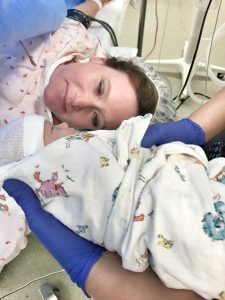 By 39 weeks, I still hadn’t dilated and my cervix was still high and off to the side. That, along with a very narrow pelvis, lead my OB and I to the decision to schedule a repeat C-section. 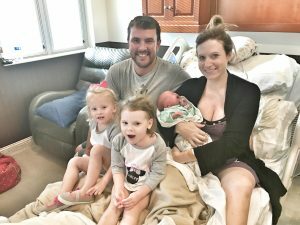 I know not everyone would agree with that decision but after a lot of prayer, I decided that this was the best and safest way to bring our new baby into the world. Like I said, this was a repeat C-section and seemed to be typical and no different from my last. I had one with my twins 3 years (and 2 weeks) ago. I knew what to expect and thought that this recovery would be easier and I would be back to my old self in no time. Boy, was I wrong! 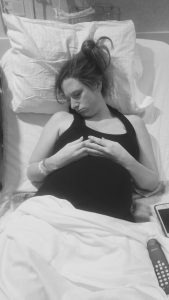 The day following surgery, I began having intense pain in my right abdomen. I could only describe it as the worst gas pain I had ever had. Along with the pain, my belly was incredibly swollen. 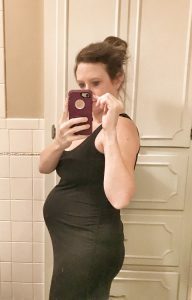 After I delivered the twins, my belly had gone down significantly so I was so surprised that by day 4, I still looked 9 months pregnant. On day 4, I was given a suppository, passed gas one time and then went home. The ride home was awful and I cried the entire way because I was in so much pain. Once home, I sat down and within an hour began have the shakes and was freezing cold. I took my temperature and it was 100.9. Within 15 minutes and after taking ibuprofen, my temp jumped to 103.4. I called my OB and was told to come back to the hospital right away. While in the ER, I had blood tests, x-rays finally a CT. The results showed that I had an ileus. This meant that my intestines were asleep and hadn’t woken up after my surgery. Everything that I had eaten and drank for the last 4 days was sitting in my large intestine and unable to go anywhere. This was why I was so swollen. My intestines were distended. I’m not one to complain a lot, which is why this wasn’t found earlier (note to self: don’t try and be a martyr). My pain level was an 11/12 on a scale from 1 to 10. I can honestly say without a doubt that this was the worst pain I had ever experienced. I was immediately put back on IV fluids and told that I couldn’t eat or drink anything until my intestines began waking up. If things didn’t start moving, I would need a NG tube which would go into my nose, down my throat and into my stomach. The purpose of this would be to remove the air that was building up inside my belly. I was so fortunate that this wasn’t necessary and with the help of time (and some suppositories; sorry TMI) I was able to very slowly find relief and healing. After 36 hours, I was able to have a liquid diet and then by day 7 in the hospital, I was released to go home and continue recovery. My stomach was still very swollen by finally beginning to “deflate”. I am so happy that at least through this entire ordeal, Maddie was able to stay with me in the hospital because I am breastfeeding. The lack of nutrition did not affect my milk supply and she even gained 1 ounce while I was on the IV. I never imagined that this would be how Maddie’s first week in this world would be but she was such a trooper through it all. I can definitely say that I won’t forget any of it. I am so blessed with an amazing village that helped with Sophie and Carley while we were in the hospital. I’m not sure what we would have done without them. And the girls did so well too considering. I have never been away from them for more than a few hours at a time so an entire week was crazy. On one of the girls’ visits to the hospital, Sophie begged and cried for Mommy to come home with her. Talk about heartbreaking. Otherwise, they did great playing at home and at our sweet neighbor’s house. Since I’ve been home, she hasn’t really let me out of her sight, but I’m okay with that. Every day gets a bit easier. I am so thankful to all of you who sent so many prayers and positive vibes our way. I felt every single one of them. I am so happy to be home with my family!